In addition to cooking classes, I also offer in-home catering services through my business FOOD LOVE. From intimate private dinners to large parties of 100 plus, I love this aspect of the business. Instead of focusing on the intricacies of technique or rehashing the basics as I do in a cooking class, I get to test my skills and creativity as I develop a menu that is unique to the client and the event he or she is planning. A couple of weeks ago, I had a party that I especially enjoyed catering. There was no special occasion, just a desire to break-in a new home, celebrate fall, and watch football with friends. While I loved putting a more sophisticated spin on tailgating favorites such as nachos, hot wings, and pulled pork sliders it was the desserts that really got me excited. In honor of one of my favorite childhood desserts, I made bite-sized s’mores with the help of a kitchen torch. Passed immediately after toasting, these flew off the platter. 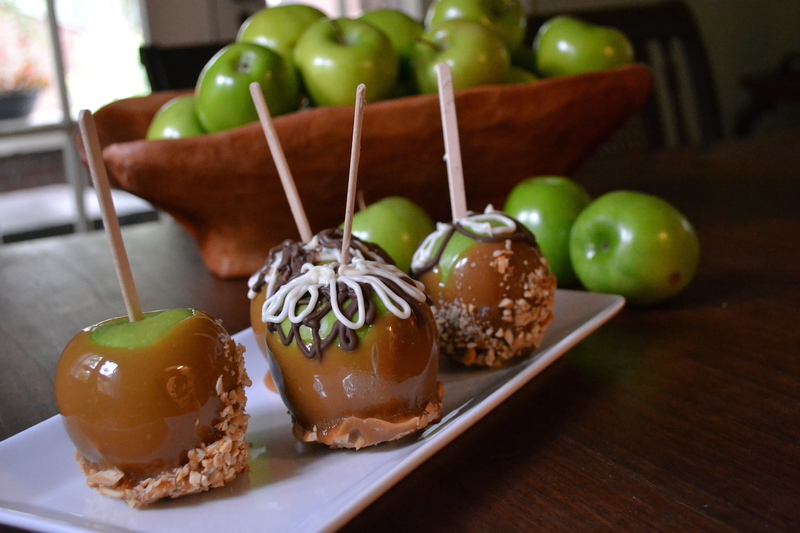 I also made caramel apples. In yet another nod to my youth, I used Kraft caramels to make the sticky coating, but then gave them a stylish twist by dipping the still-warm caramel into chopped, lightly-salted cashews and drizzling them with white and dark chocolate. The resulting dessert was so pretty that we scattered the apples around the house as edible decorations. To be fair, the apples weren’t eaten at the party, nor did I expect them to be. Anyone who has ever tried to balance a drink in one hand while eating with the other has learned to loathe the too large and too messy hors d’oeuvre. 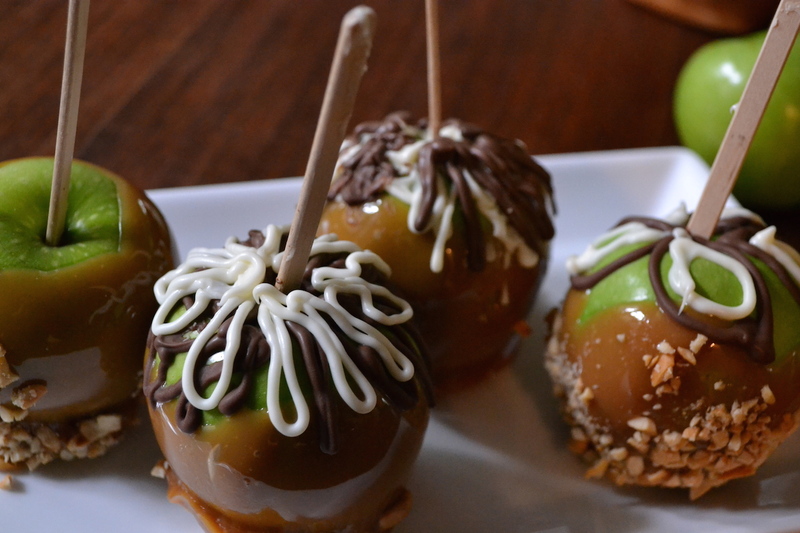 Sticky with caramel, an apple, precariously balanced on a stick, is both large and messy and terrible as a passed-appetizer. Despite those failures, they are a perfect take-home gift. Small plastic bags and strands of decorative ribbon were left by the door and we encouraged guests to take an apple (or two) home for them or their children. It’s these apples ability to both set a mood and serve as a next day remembrance of a special evening that made me want to share them with you today. With Halloween just days away and lots of holiday festivities in our future, these sweet and sticky apples might be just the treat you and your guests need. 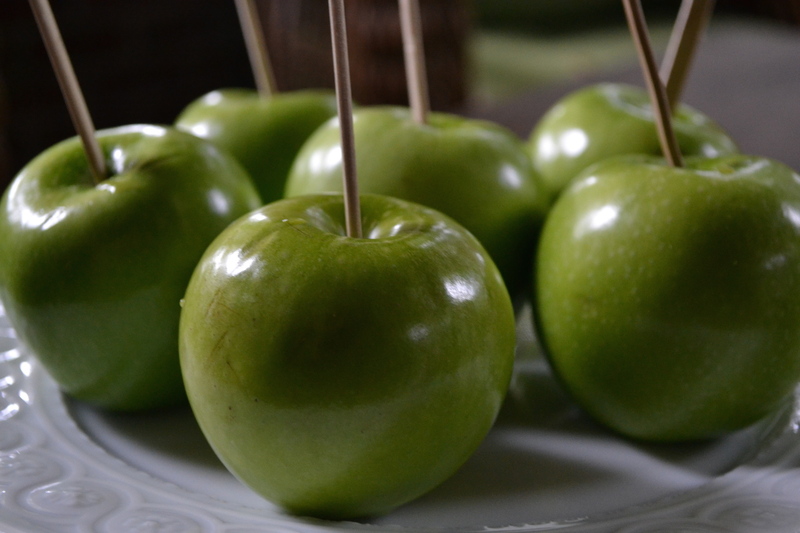 Placing these apples in a plastic bag and tying them with colorful ribbon make them a festive party favor or the perfect holiday gift for teachers and friends. Wash the apples well under cold water and use a clean washcloth to rub the skin to remove any waxy residue. Dry completely. Stick a popsicle stick through the stem of each apple. Lay a piece of wax paper on a large plate or baking dish. Spray generously with cooking spray. Place the chopped cashews on a plate. Unwrap the caramels and place them in a small bowl with the water. Microwave on medium-high for 1 minute. Stir and then return the caramel mixture to the microwave for another 30 seconds. Repeat, stirring after each cooking time, until the caramel is melted and smooth. Be careful working with the caramel as it gets very hot and can cause a nasty burn. Dip the apples into the caramel and let excess caramel drip back into the bowl. While the caramel is still warm, roll the caramel-covered apple over the chopped cashews. Place the apples on the greased wax paper. Place the white bark squares in a measuring cup and microwave according to package directions. White chocolate can be drizzled over the apples using a spoon or use a funnel to pour the melted chocolate into a squeeze bottle. Repeat with the dark chocolate. 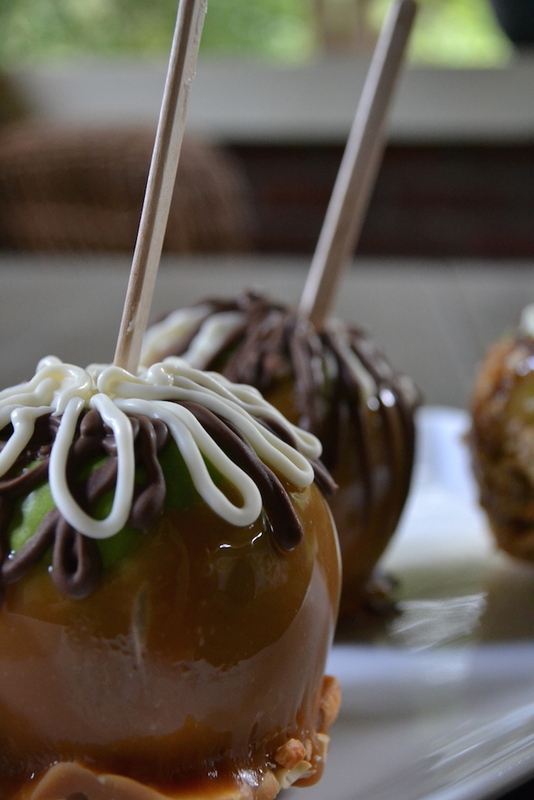 Drizzle the white and dark chocolate decoratively over the apples. Once decorated, put the apples in the refrigerator to set. 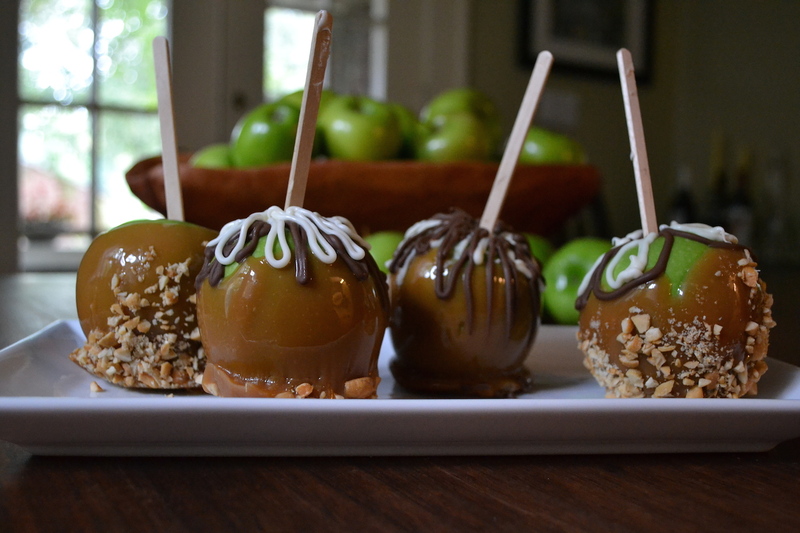 Allow the caramel and chocolate apples to come to room temperature before serving. Enjoy!